A New Jersey scientist's wacky workouts have captured the attention of one of the world's most famous athletes -- but perhaps not for the right reasons. Ahmed Ibrahim, 55, has been making up his own ways of using the gym machines since he started exercising five years ago. 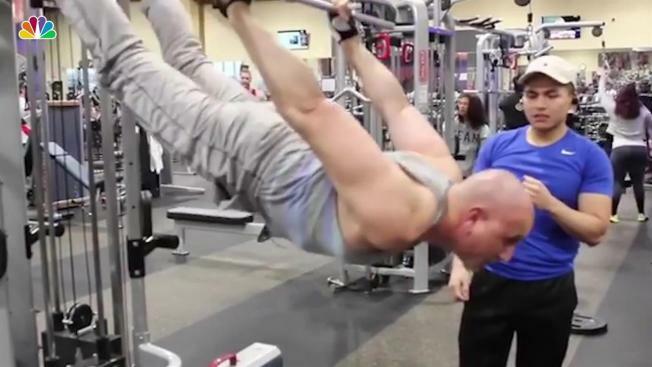 But lately his absurd routines have been turning heads beyond his local gym, with videos of the Nutley man finding an audience with millions of people online. But if the Internet is judging, Ibrahim tells NBC 4 he doesn’t care. It all took off when fellow gym-goer Emilio Gomez posted a video of Ibrahim to Instagram. It shows him using a cable crossover machine in the most unique fashion: throwing himself to the ceiling and then falling onto his back. An onlooker at the 24 Hour Fitness in Wayne Town Center can be seen staring, apparently bewildered. That video somehow reached stars Snoop Dogg and Shaquille O'Neal last week, who both reposted it, with the video getting more than 1.5 million views each on their pages. Other videos of Ibrahim have also garnered tens of millions of views on fitness Instagram accounts. Gomez said he and other gym-goers always had a good time watching the 55-year-old work out. "He's super dedicated and motivated. In his mind nothing gonna stop him from having great workout,” he said. “I feel like he's from one of those superhero planets. A combination of Spiderman and the Hulk with a dash of Daredevil." Take a scroll through Ibrahim's Instagram and Facebook and you'll see Gomez’s clip is just one example of the father-of-four's crazy workouts, including pedaling his legs in the air, crunches on the stair-climber and swinging to the ceiling on the monkey bars. Shaq may have labeled Ibrahim's workout a 'Shaqtin a Fool workout edition', after his basketball bloopers segment on "Inside the NBA", but Ibrahim swears the unique workouts have helped him get his life back, and he doesn't care what anyone says about them. "Everyone looks at me like I’m a weird person for doing these exercises," he says. "They love me but they say 'The stuff he does is weird', they laugh at me. I tell them 'I’m not mad, guys. Everybody has their own workout that works for them. I have muscles like you guys but I’m doing it a different way'." Ibrahim has been making up his own ways to use the gym equipment since he started working out in 2014. He started exercising for the first time in his life after he was diagnosed with multiple herniated discs in his neck, due to being bent over a microscope all day in his role as a genetic technologist. "When I started four years ago I couldn’t do half a push-up. Now you ask me to do 500 push-ups I can do it," he said. He credits his 18 hours per week minimum at the gym with helping him move past his ailments, saying his slipped discs are no longer a problem. Trainers at the gyms have told him he's not allowed to use the equipment in the way he does, but he doesn't pay them any mind. "I say, 'You have a policy that if you have an injury it's the own person’s problem. I'm not going to sue you, I read the sign, don't worry about me. I know what I’m doing'." He says he just wants to stay healthy and make his children proud. While his videos now get up to 5 million hits each on social media, he says the celebrity attention does nothing for him. "The only thing that makes me happy is when I show the videos to my kids and they're proud of me that everyone is talking. I see them smiling and the happiness in their face and it makes me jump, like it is the greatest feeling."